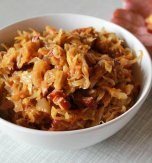 Here is the wonderful recipe for cabbage dish which takes its roots from Transcarpathia and is called kulish. 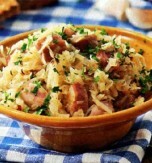 This dish was often served during weddings. 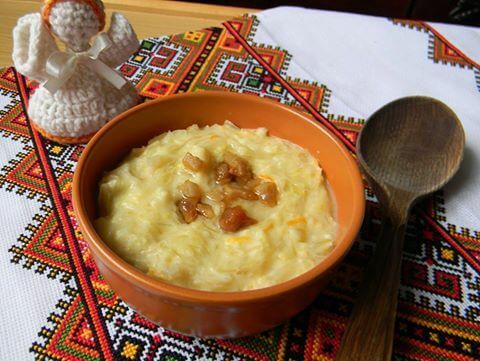 Back in the day each Ukrainian wedding couldn’t go without this dish. Each mistress had her own recipe which was kept as a big secret. 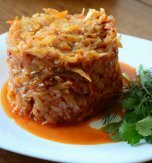 This dish has a very unusual method of cooking and the result is more than delicious. 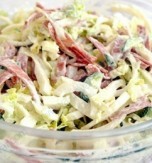 It can be cooked using whether fresh or sour cabbage, depending on your tastes and preferences. Chop cabbage and put in a pan. Pour it with water and cook until soft. Then add sour cream and stew the mass until thickened. Boil millet separately. Then cool it and puree in a food processor. Stir in the cabbage mass. Mix everything until smooth. Transfer the mass to a pan. Adjust salt to your taste. Pour in milk mixed with flour. Cook the mass for 10 minutes, stirring it constantly. Cube salo and fry it until golden. Transfer the prepared mass to a plate. Top it with fried salo before serving. 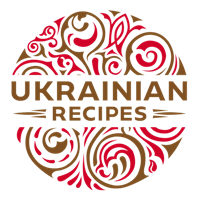 Do you have a favorite Ukrainian recipe for cabbage? If so, please let us know in the comments below or write us an e-mail.